A unique optical-electronic system now being tested in Russia ensures maximum protection for tanks and armored fighting vehicles against high-precision enemy missiles with the help of an impenetrable smokescreen, the newspaper Izvestia reported. The system, developed by Electromashina research and production association, is installed on Armata tanks, Kurganets and Bumerang armored vehicles and detects laser beams or oncoming missiles and fires special smoke grenades, which make the fighting vehicle invisible both to the naked eye and to infrared scopes. “The system is currently undergoing field trials and we expect to have this work done before this year is out,” a Defense Ministry representative told the newspaper, adding that live-fire tests of the system were slated for next year. At the heart of the new system is a computer which calculates optimal trajectories of the smoke grenades to ensure maximum smoke cover while allowing the crew to engage the enemy unhindered. 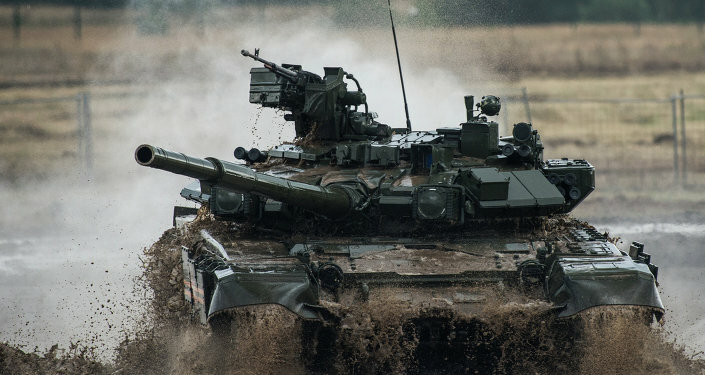 “In Europe they have tried and failed to develop such a system, while in the US they have never developed anything like our optical-electronic system, traditionally staking on passive protection reinforcing armor, improving maneuverability and battlefield control in order to better protect against enemy anti-tank fire,” independent military expert Oleg Zheltonozhka, told Izvestia. The new system ensures maximum protection against the two main types of guided antitank missiles: remote-controlled and laser-guided. The former will not be able to receive radio commands, while the latter will simply fail to “see” the laser beam itself. It will also be able to effectively handle America’s unique self-homing Javelin antitank guided missiles. “The Javelin is the world’s only system of 100-percent self-homing missiles, which calculate their trajectory depending on the target’s visible silhouette and its heat signature. Reaching its target the missile climbs above and strikes down on the target to penetrate the roof of the tank where there is the least armor protection,” the Defense Ministry representative told the newspaper. “However, when such a missile swoops down on its target, the smokescreen created by our system will shroud the tank and, unable to either see its silhouette or heat signature, the missile will miss,” he added.